Free, Clean, Powerful & Easy-to-use iPhone Transfer Software! Syncios iPhone Transfer is an ideal and free iPhone transfer tool to backup iPhone music and video to PC, copy iPhone contents to any desired PC and easily transfer files between iPhone and computer. 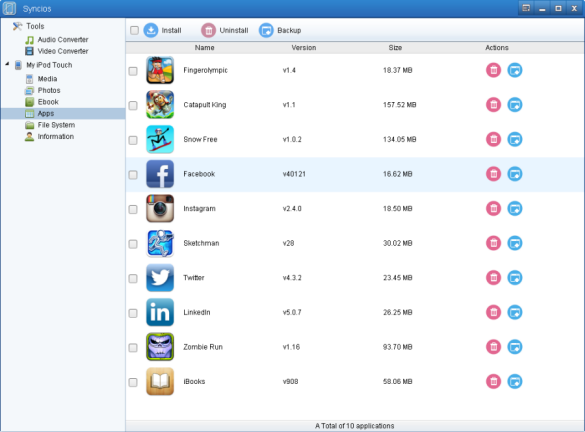 With this powerful piece of freeware, you can sync iPhone with computer without iTunes at zero cost. Support iPhone 5S and any previous versions. The Syncios iPhone Transfer Software is an ideal and free iPhone transfer tool to backup iPhone music and video to PC, copy any iPhone contents and easily transfer files between computer and iPhone. Transfer music, movies, music videos from PC to iPhone easily. No need to erase original iPhone files, and just add files as you want. Easily add files from local hard disk, and delete useless apps, unwanted musics, videos to release free space for new files. Including iPhone 5S, iPhone 5C, iPhone 5, iPhone 4S, iPhone 4, iPhone 3G, iPhone 3GS, and all previous versions. Even compatible with iPad and iPod. Browse to any file folder in iPhone, transfer file from local hard drive to your iPhone. 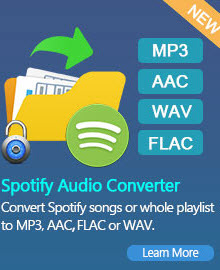 Syncios iPhone Transfer is also a free video converter & audio converter. 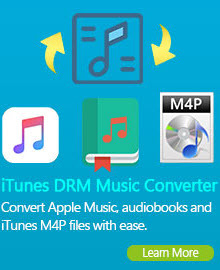 It allows you to convert videos/audios to MP4, MOV, M4V, MP3, M4A, M4R and CAF for iPod/iPad/iPhone. 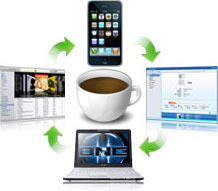 Syncios iPhone Transfer can manage and backup the information on iPhone. Syncios also enable you to backup, remove or add new contacts, bookmarks, notes, voice memos. Syncios iPhone Transfer can freely and easily transfer videos, musics and photos between iPhone and PC. With this iPhone transfer software, you can exchage videos, musics and other files between PC and iPhone with great ease, and transfer your iPhone files to computer for backup and management. In all, Syncios iPhone Transfer can greatly facilitate files transfer, copy and backup among iPhone and PC for users, enable us to freely and easily manage and make full use of iPhone.